Environmental protection and safety take top priority during the exploitation and processing of these raw materials. The bolting systems selected in these areas need to meet the toughest standards when it comes to service life, safety and suitability for a wide variety of applications. Today, ATEX bolting systems made by Plarad are used with great success around the globe. Even the most challenging environmental conditions (temperature, pressure, etc.) do not pose any restrictions on Plarad equipment. We offer bolting systems that are suitable for even the most challenging applications (e.g. cramped spaces). 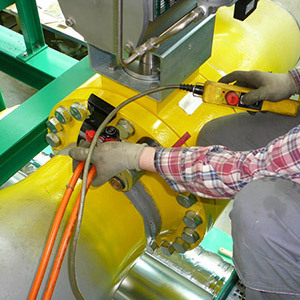 The German Institution for Accident Insurance and Prevention for the raw materials and chemical industry considers the purchase of Plarad bolting systems to be a measure that qualifies for a bonus and refunds the buyer (subject to certain conditions) 20% of the purchase price charged for one of Plarad's pneumatic or electric nut runners. For detailed information on the bonus system established by the BG RCI, log on to www.bgrci.de.